With mums, a great option to buy them is fashion and loungewear. You will probably already know their clothing sizes and taste, so there's no need to be asking sneaky questions or taking a peek at their clothing labels to find out their size. When it comes to my mum, slippers are a no-brainer! She loves to be comfortable and warm, so I know she'll always be chuffed with something she can wear around the house. These slippers, in particular, are right up her street. During the summer she loves wearing her Birkenstocks around the house but as soon as the temperature drops they don't really keep her feet warm. 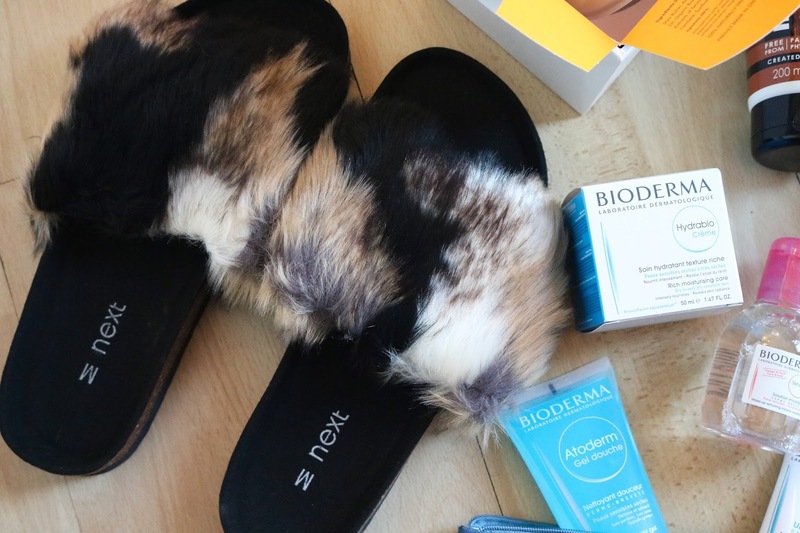 These furry sliders from Next will solve all her problems with keeping her feet warm, but will still have the arch support like a Birkenstock. What would Christmas be like without the humble Christmas jumper? Be it novelty or sophisticated, festive jumpers always make a great gift choice. The beauty of having a simple Christmas jumper is that you can wear it out a lot more than a novelty one, as it isn't obviously festive. This mistletoe jumper is another gem from Next, and can easily be dressed up smartly or worn casually with jeans. The details are perfectly dainty, with little pearl mistletoe berries and metallic threading on the cuffs. It is out of stock but don't worry, they have loads of other cute jumper options for you, your mum, and everyone in your family. Spoiling your mum leads right on to hair and beauty products. 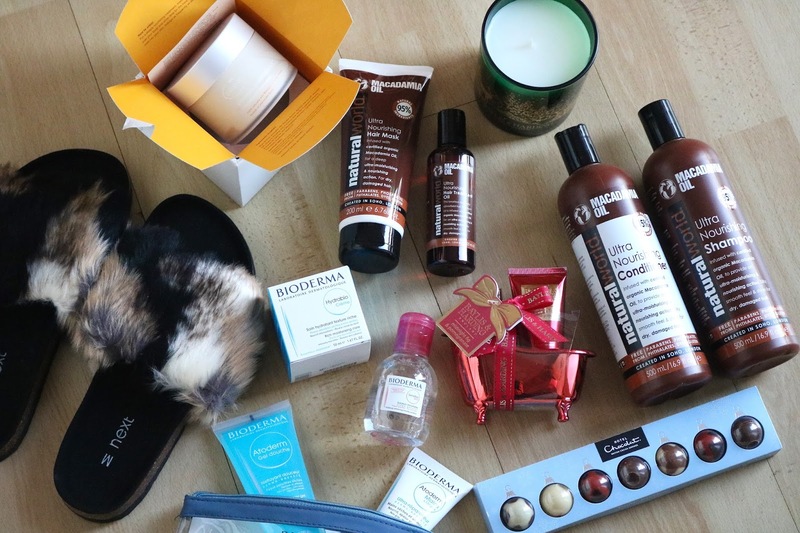 Giving them something that they can use to pamper themselves after a long day is a great gift option, and as always, there are loads of options to choose from. You can either give her something she already uses and loves, or treat her to something new that she might have been wanting to get for a while. Let's start with haircare- this will obviously depend on what type of hair they have (coloured or natural) with what type of product you buy them. Gifting someone with a full haircare range is a great way for them to find new products they love, like a shampoo and conditioner combo or a nourishing hair serum or mask. I love Natural World's products and have been using and working with them for a long time, so with my hand on my heart I can say they are one of my favourite haircare brands. I'm a big fan of their treatment oils in particular, which always leave my hair super soft and healthy. 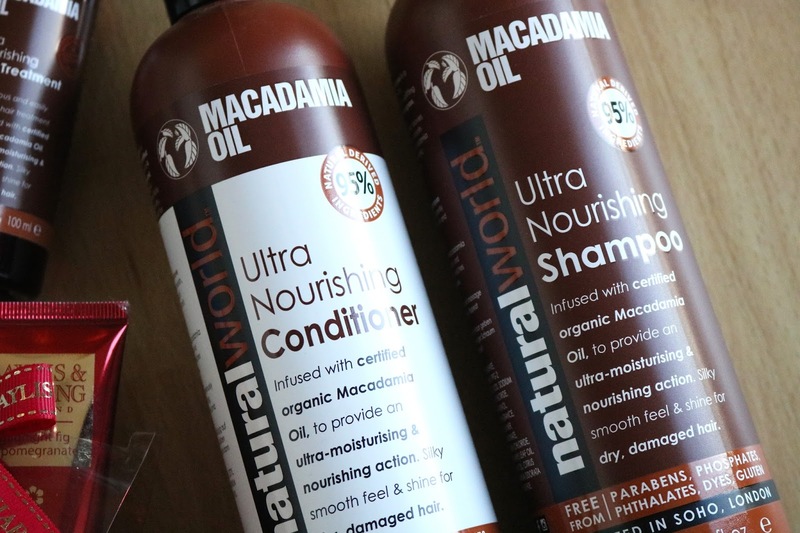 Their Macadamia Oil range features a shampoo, conditioner, hair mask and treatment oil and is also infused with cedarwood, rosemary, lemongrass, orange and ylang-ylang to leave hair nourished and shiny without irritating the scalp. In my opinion, a body butter is probably one of the most luxurious ways of pampering yourself- covering yourself with a super moisturising cream that will leave you so smooth you might slip off your seat makes showers and baths a much more pleasurable experience. 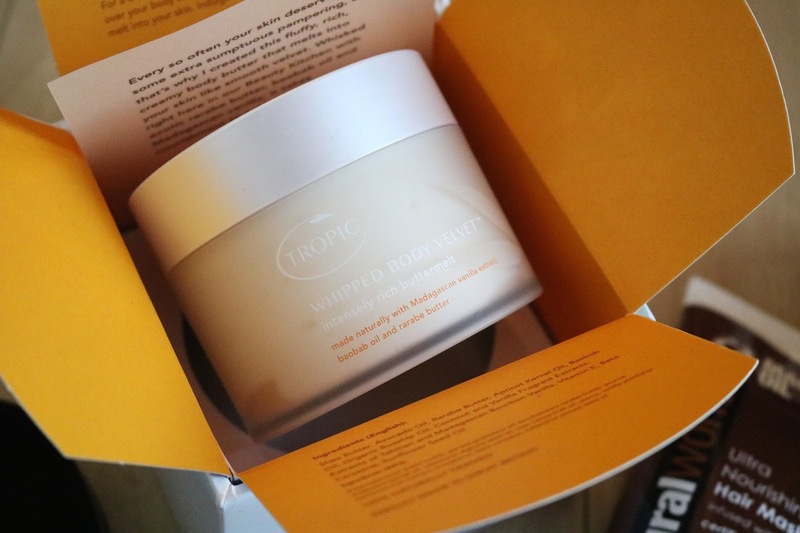 If you're looking at really treating your mum, then Tropic's Whipped Body Velvet Intensely Rich Buttermelt would be a great option. It is on the more pricey side, but you do get amazing quality for your money with its luxurious mouse like consistency that leaves your skin moisturised and smooth for the whole day. It sinks into the skin easily after warming it with your hands and contains Madagascan vanilla extract, macadamia oil (you can tell I love the stuff), and rarabe butter to help soothe dry skin. Treating someone to products from their favourite skincare brand is a great last minute idea if you're struggling to pick something out for them and there are loads of collections available with travel sized and full-sized products. 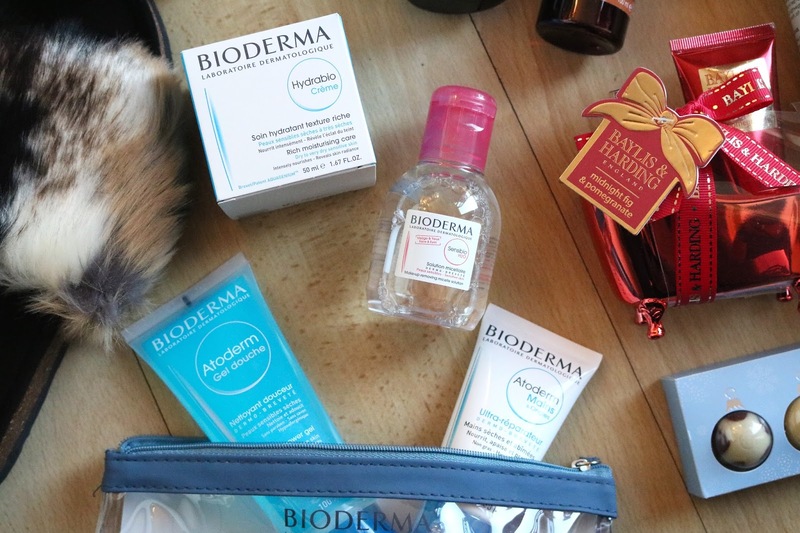 After introducing my mum to Bioderma, she has been a fan of their micellar water ever since! This travel-sized set has some holy grail items as well as ones I've never tried before but I'm now in love with! Take the Atoderm shower gel- it soothed the small bits of eczema I had on my skin and left it really smooth. Also, the Hydrabio moisturising cream locks in moisture for a long time and amazingly teaches the skin to moisturise itself again restoring skin’s suppleness, softness and radiance. As well as getting a main present, I also like to give my mum lots of little stocking fillers in my continued effort to spoil her. Keep a lookout in the shops as well as online, as I normally find little presents like this quite by chance. 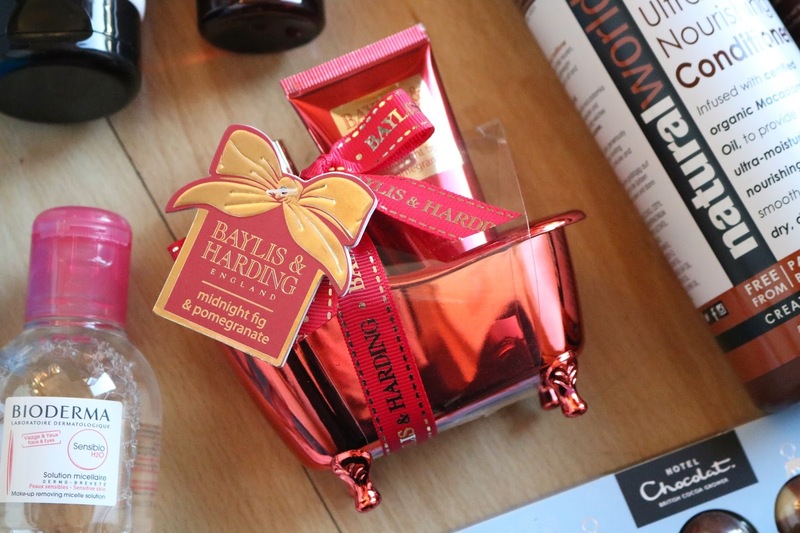 Baylis and Harding always get it spot on with their products and packaging like this Midnight Fig and Pomegranate Bath Time Treats Set. I mean, how adorable is this little roll top bath?! The gorgeous smelling shower creme and body butter are also great products in their own right. This set is currently out of stock but there are plenty of other scents in this set available. I'm yet to meet someone who doesn't like candles. You can give them as a stocking filler in the form of tea lights and votives, or as the main gift with three wick candles. Whatever you choose the scent is always key! 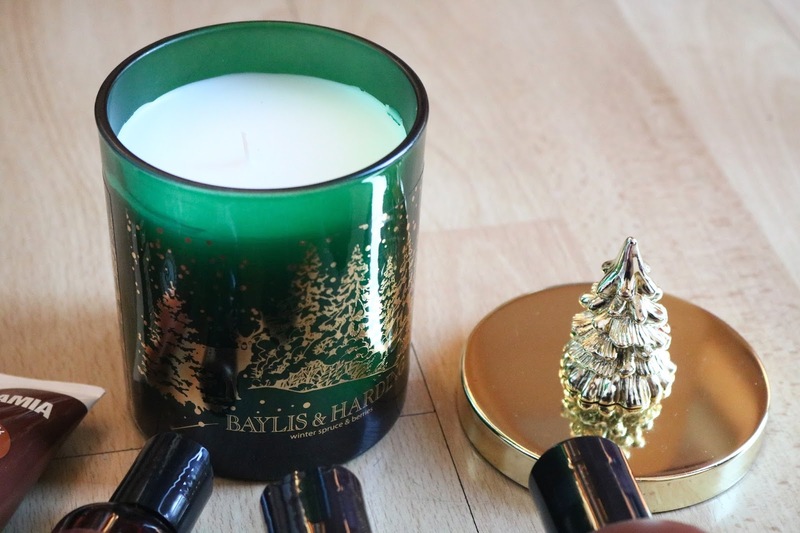 Baylis and Harding don't only do beauty, but also the most amazing smelling candles. The Winter Spruce and Berries candle comes beautifully decorated with this embossed jar and Christmas tree decorated lid. Most importantly, it smells so good. To put it simply, it's like Christmas in a jar with hints of cinnamon, pine and red berries, and creates a lovely aroma that isn't too overpowering in a room. This scent isn't currently available but again there are plenty of other scents to choose from. Again, giving chocolate as a gift doesn't have to be boring, especially when they look good. Make sure you pick selections in interesting flavours or in cool packaging, and these will make another great stocking filler for your mum. It was a real struggle not to eat these before I shot them! 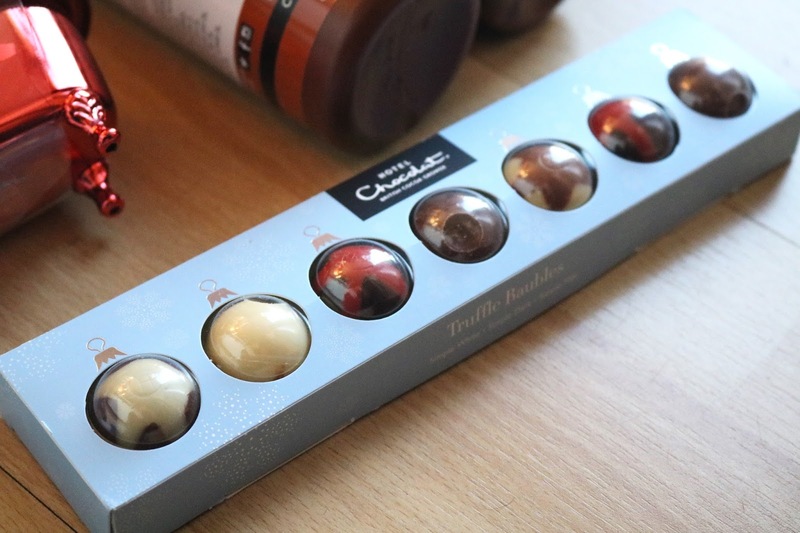 When I worked with Hotel Chocolat last year, I fell in love with their truffles in their advent calendar, and now they are back in my life in the form of these truffle baubles. These filled chocolates come in their three classic types: simple white, dark and milk, and can be used in their mix and match deal where you can buy 3 or more items for £6 each. If you're looking for some more sets to pick out, check out the enchanted trees set in my gift guide for grandmas and mother in laws, and the portly penguins set in my men's guide. And now for the giveaway! 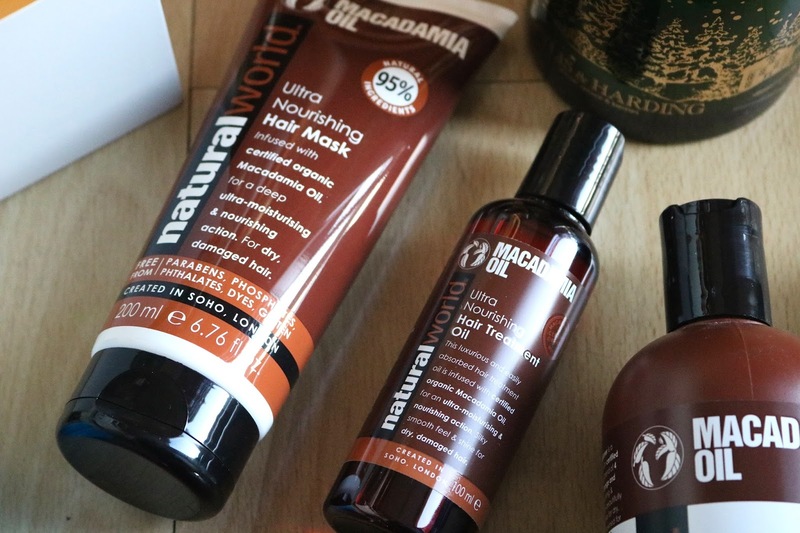 Natural World are giving one of you the chance to win the entire Macadamia Oil haircare range featured in this gift guide! To enter, just fill out the Rafflecopter form below. Good luck! As always, many thanks to the brands who gifted items for this guide!